China’s investment in sensitive U.S. technology has the Trump administration so worried that it imposed tariffs on Chinese tech goods on Tuesday, while lawmakers are looking for ways to bar similar future investments. Why now? One reason is a recent Pentagon white paper that warns about Beijing’s plans to appropriate made-in-America tech. Initially written last year and circulated to a small audience of military officials and lawmakers, the so-called DIUx Paper (named for the Defense Innovation Unit Experimental outreach group), describes how technological progress fits into China’s long-term strategic plans. The paper’s authors conclude that keeping pace will require a comprehensive U.S. government response, including investments in science and technology and other measures that go well beyond punitive trade restrictions. In interviews, the authors were modest about the role that the paper is playing in the current tariff debate and cautioned against inflating its importance. But they acknowledge that they’ve discussed the paper at length with the members of the administration, the National Security Council, and Congress. 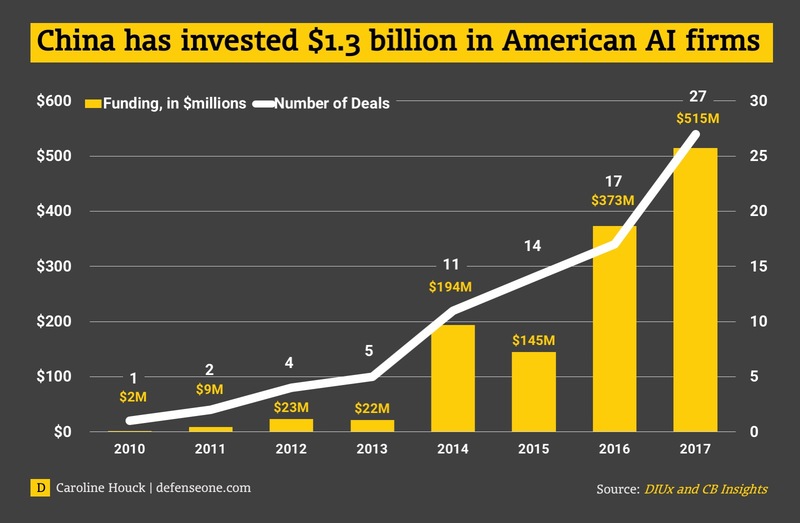 Last spring, Sen. John Cornyn, R-Texas, cited the paper as he argued for new legislation to allow the Committee on Foreign Investment in the United States, or CFIUS, to restrict Chinese investment into U.S. tech companies, particularly startups. The proposed legislation now enjoys the support of the Trump administration and is expected to pass. The paper, which contains no classified or sensitive information, was initially kept from the public. The Pentagon denied a June, 2017 Freedom of Information Act request by Defense One to release it. Its final version appeared on the DIUX website in March with no prior notification. The paper argues that China “is executing a multi-decade plan to transfer technology to increase the size and value-add of its economy…and decrease U.S. relevance globally.” That plan involves some illegal measures, including industrial espionage and cyber theft, but also perfectly legal forced-joint ventures, acquisitions, and early-stage investment in startups. When “the Chinese make an investment in an early stage company developing advanced technology, there is an opportunity cost to the U.S. since that company is potentially off-limits for purposes of working with the Defense Department,” it says. 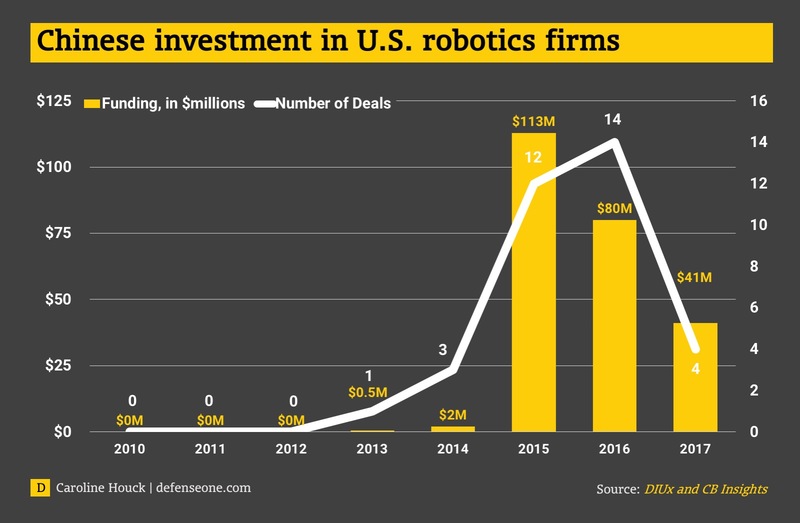 The paper notes in particular increased Chinese foreign investment in several areas of importance to U.S. national security: artificial intelligence; robotics, and augmented and virtual reality, a key part of the military’s plans for future training. (Less directly relevant to national security, the paper also mentions financial technology.) It also outlines 16 “Manhattan projects” in aircraft design, quantum computing, neuroscience, and other fields in which China is aggressively investing as a nation state. The paper says CFIUS changes and other legal remedies. could be helpful, but it says more actions are needed, including better funding for basic science and research and immigration policies to help people with tech skills legally immigrate to the United States. The first step, the authors say, is to conduct a compressive analysis about exactly what sensitive technologies might evolve the fastest; which ones are the most important to U.S. national security; and which ones can be influenced by economic policy, direct, government-led investment, private sector investment or other forms of influence. “It would be foolhardy to say "we need to protect all of U.S. technology." Instead, we need to understand the technologies that are most critical for national security and then think through how we protect those. As an example, there's no question AI will be a dual-use and critical technology but we need to think about whether we want to protect the algorithms, the data sets or something else. Whatever we decide to protect we must do in concert with allies so that our actions are not protectionist and penalize our own development more than they prevent a technology from falling into adversary's hands,” said Michael Brown, one of the paper’s authors. The budget for military research and development is up about 18 percent under Trump, but funding for basic science and research in other areas is flat. Massive and growing budget deficits portend a dim future for robust research and development spending. Most important, say the authors, restrictions on trade have to be coordinated with other allies if they are to have the right effect. "I believe there's room to clarify what our policy is relative to China. For years, we've been focused on free trade and investment; now as China becomes a peer competitor not just economically but technologically, we need all Americans to understand the potential negative consequences of China's (mercantilist) unfair trade practices as well as the scale of IP theft underway,” said Brown. “Example, when you raise tariffs on steel and aluminum and you aren’t doing that it concert with allies" your tariffs are unlikely to have the desired effect. The Trump administration and lawmakers are pushing ahead with measures to decrease, or in some cases, bar Chinese investment in U.S. technology. The administration is considering using the obscure 1977 International Emergency Economic Powers Act. “The administration's efforts to beef up the CFIUS process to make sure that we’re protecting our US intellectual properties — a lot of that in the past has migrated offshore through both legal and nefarious means – whatever we can do to help protect that, also it’s good for the industry in the U.S. It’s an important part of the Administration’s program set,” Dale Ormond, the principal director of research in the office of the assistant defense secretary for research and engineering, said at an AUVSI event last February.